Feeding livestock is part science, part art, developed by farmers over generations. It is true that cows have four stomachs, so they eat differently than most of us. However, just like other living organisms, cows need the proper food and nutrition to grow and live healthy lives. When available, unlimited pasture access is the best feeding option for cows. If lush pasture is not available, farmers feed hay. Hay is generally dried and baled grass, legume or straw according to Hobby Farms website. Grass hay includes fescue, timothy and orchard grass. Legume hay, such as alfalfa and clover, has higher energy and protein content than other hay, and is often fed to cows needing more protein. The type of hay farmers feed generally depends on the farms' geographical location. For instance, timothy hay is readily available in northern states, whereas fescue is available in southern states. Grain provides cows a significant source of energy when fed in conjunction with hay or forage. Commercial gains farmers feed to cows are often composed of corn, oats, barley or a mixture. While barley is the least expensive, oats are often the preferred grains because they are easily digested by cattle due to the high fiber content. Farmers supply cows with 1.8 percent to 2.5 percent of their body weight, generally 4 to 8 pounds per individual cow, of grain per day. Silage is a form of feed created by chopping up grass or corn while it is still green. The matter undergoes a fermentation process whereby the oxygen is removed and lactic acid bacteria help the plant store carbohydrates. In the event of a drought, farmers feed silage in place of grain and hay. The amount fed depends on the actual energy and nutrient content of the silage. 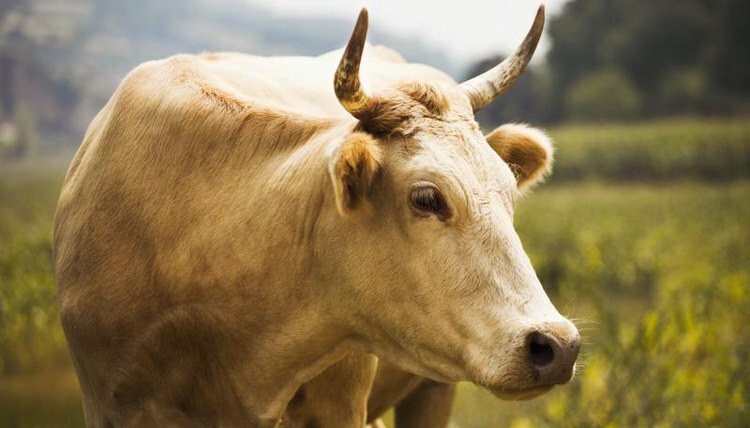 When pasture grass and grain feeding do not provide enough of a primary nutrient, such as sulfur, salt or protein, farmers generally give cows supplements. Supplements come in several varieties, such as trace mineral and salt block licks, and seeds. Common seeds used as cattle supplements are cottonseeds and lupins. Supplements are fed in addition to forage and grain.